The MI5,CIA,FBI of Israel - Mossad. Known for it's famous operations around the globe, especially the assassination in Dubai and for the current actions against Iran ( there isn't any proof but we believe that it was a Mossad's job ). 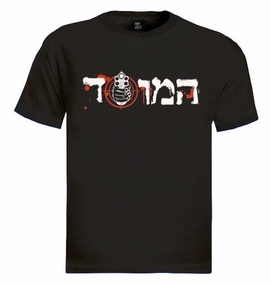 This awesome T-shirt is a deadly design, Mossad written in Hebrew with a sniper target. Made from 100% Heroes & Cotton T-Shirt, unique and hard to find. Our t-shirts are made of 100% cotton and are long lasting with bright colors. Our products are all designed and printed in Israel.